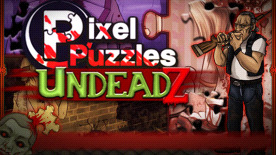 Pixel Puzzles: UndeadZ is a traditional style jigsaw puzzle game with top down shooter gameplay throw in to ruin your day and peaceful puzzling experience. Dead things want to eat you whilst you puzzle. You'll have to keep the dead dudez at bay with a mixture of mines, barricades, bullets and nades. Pixel Puzzles: UndeadZ © 2014. All Rights Reserved.